A host of picturesque and historic, towns and villages on our doorstep, including Robinson Crusoe's birthplace at Lower Largo. Four golf courses within three miles, including the Open Championship qualifying course at Lundin Links. 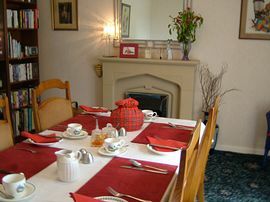 In an elevated location, overlooking Largo Bay in the golf kingdom of Fife, Fluthers Wood B&B is a charming country cottage in two acres of gardens with private, secure parking. We are close to all the East Neuk fishing villages and less than 15 miles from St. Andrews. 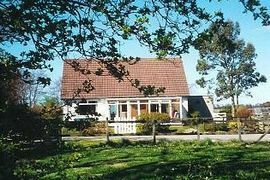 Fluthers Wood is a comfortable and convenient holiday base for walking, cycling, sightseeing, fishing and golf. Fourteen golf courses are within a twelve mile radius while Fife Cycle Ways and the Fife Coastal Walk are also nearby, as well as all the other treasures of the kingdom. 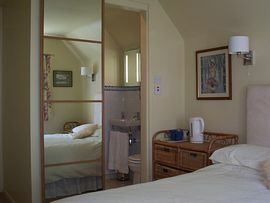 Please visit our website to view our guest rooms and facilities. Rosemary and Drew look forward to helping you get the most from your bed and breakfast experience. 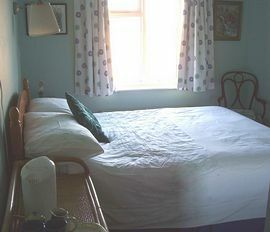 Ensuite Double Room: From £25.00 pppn. 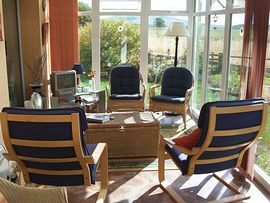 Single occupancy: From £35.00 pppn. Special Diets Provision: Special diets are catered for. Vegetarian and vegan diets by arrangement. Booked in for two nights and stayed four. That says it all. Warm, comfortable, well fed and made most welcome. Thank you. Fantastic welcome, brilliant breakfast, such a comfy bed. We couldn't have asked for more. We'll be back. We've had a great few days here - probably the most hospitable place we've stayed in! Love the location, room and food. Thank you so much for a very, very enjoyable stay. We've enjoyed the food immensely and the room is beautiful. We love all the little extra touches which show you really care about your guests. Leven lies on the coast of Largo Bay. Once in Fife, it is easily located from the south via Kirkcaldy and then taking the A915 (Leven and St Andrews route). Once in Leven continue on the A915, straight ahead at traffic lights. You will now pass a small school and then a sports park, both on the left side. About half a mile further on is Letham Glen roundabout - go straight ahead and up Scoonie Brae (a steep hill with a cemetery on the right hand side). At the top of this hill the road branches abruptly to the left. Take this left branch. This is the 'Cupar Road' (B927) and you are now within two miles of Fluthers Wood. Continuing up the B927 you will pass three branches to the right, all before our house. The first is signposted for Blacketyside Farm, the second for Bankhead Farm and the third (at the top of a steep hill) is an alternative route for Lundin Links. You are now approximately 100 yards from our gate. Cross two sets of yellow rumble strips and our gateway is on the right hand side behind the trees. You have arrived at Fluthers Wood. Approach via Glenrothes and then the A911 which links with the A915, east of Windygates - then head for Leven as above. Approach via Cupar and then take the A916 heading south. Careful, the A916 and the A914 fork here as you leave Cupar - the A916 is the left fork. Continue on the A916 for approximately six miles (via Craigrothie). Around the six miles mark you will pass a small rural school (Smithygreen) on the left side of a downslope. The B927 (Leven), which you need to take next, is at the bottom of this slope. Branch left onto this B927 and Fluthers Wood is on the left, about half a mile on.